The Supreme Court has just told the nation’s workers: If you’re underpaid at work, or if you face discrimination on the job, you’re on your own. Federal labor law protects the right of workers to join together to improve their conditions, whether through a union or other means. But the court has now carved out a big exception to that longstanding principle. In a 5-4 decision on Monday, the court said that companies can use arbitration clauses in employment contracts to bar workers from joining forces in legal actions over problems in the workplace. 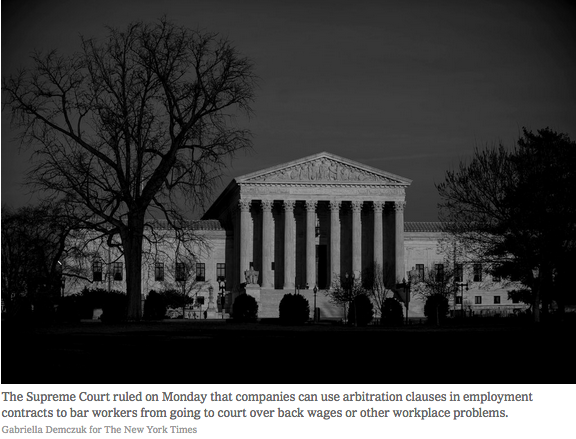 In other words, workers who are underpaid, harassed or discriminated against will have to press their cases alone in arbitration, rather than with their colleagues in a class-action case, or even with their own lawsuit. This decision, Epic Systems Corporation v. Lewis, would be a blow at any moment, but it’s especially harmful now. The rights of workers are under attack. Wage theft is rampant through violations of minimum-wage laws, refusal to pay overtime and forcing employees to work off the clock. Our crude national discourse encourages all types of discrimination. And we now know better than ever how pervasive sexual harassment is.